Today Jason left for Atlanta, GA. He is driving from Seattle to Atlanta!!! Oh that crazy man of mine. I miss him so much already and he's only been gone for 12 hours :( He'll be back on October 23rd. I can't wait to see his sweet face. Until then I will be doing dinner for one. Some nights it'll be a microwave meal I'm sure. 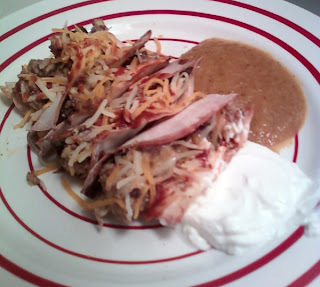 And other it'll be tasty goodness, Like these BAKED WONTON TACOS!!!! Yummy! Please excuse the messy photos. I didn't have plans to blog about this, but while putting in the wontons to bake, I figured why the heck not? It's a super easy meal and kinda messy, which can me super fun too! This is definitely a meal that I just threw together. All I had to do was go get the wonton wrappers, other than that I had everything at home. Thankfully the grocery store is a ten minute walk away, if that. Preheat oven to 400 degrees. In a small skillet on medium high heat, throw in your garlic and cook 3-5 minutes or until transparent, toss in your chicken, sprinkle a pinch of cumin and seasonings of choice (like always I used Adobo) and cook until browned, and juice runs clear. Once fully cooked, add in the black beans. Turn heat to low, and cover. Once your oven is preheated, bake your wontons. Put the wrappers on top of tall baking dish, draping over the sides. 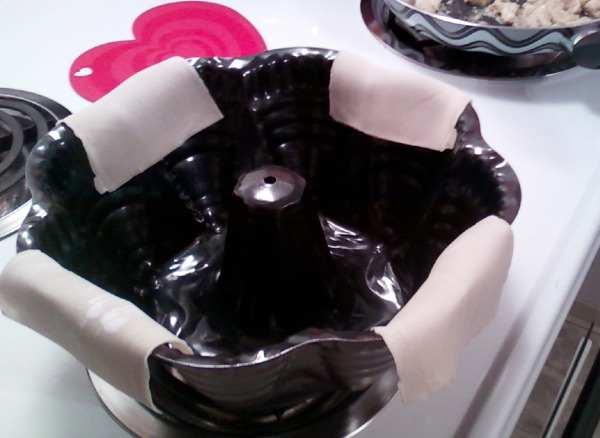 I used my bundt pan, hahaha. Bake for 7-10 minutes or until lightly golden brown. I baked mine for a full 10 minutes. I like them dark and super crispy! Once they are done, remove from the oven and cool until you are able to handle them. Once cool enough to touch, pile in your chicken and black bean mixture, and pile the toppings high! It is super messy, but so so good. Promise!!!!! You can do this with any kind of meat you'd like, even cubed tofu! Yum. Different veggies, really ANYTHING your little heart desires. Have fun, get messy, and enjoy!